Very early in the discussions about the line, George Hudson was involved. His York and North Midland Railway (YNMR) York to Scarborough branch ran through Malton and he was ever keen to protect his railways. A little later, he made an unauthorised purchase of £40,000 worth of M&DR shares on behalf of the YNMR. Consulting Engineer John Birkinshaw was appointed with Acting (Resident) Engineer A. L. Dickens. Birkinshaw was a pupil of Robert Stephenson and had considerable experience in railway construction. The M&DR Bill passed through Parliament in 1846. 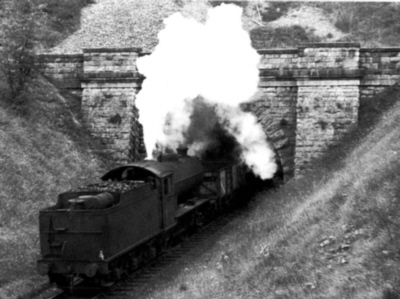 Although surveying took place immediately it was decided to defer construction until building of the Thirsk to Malton line was underway. Although the Thirsk line was still not started, construction began in 1847. At first, construction concentrated on the easy, southern part of the line together with its major engineering project, Burdale tunnel. Soon after construction started, the company encountered a financial crisis. There was a general depression in the country and the "Railway Mania" bubble had burst. Costs were clearly more than had been reckoned on and money from prospective shareholders was becoming difficult to obtain. So the construction work was cut back and eventually suspended with just enough being done to stop the tunnel workings becoming flooded. In 1850 work resumed but changes were made which finally prevented the line from becoming a trunk route. As part of the cost cutting exercises, the route was shortened by taking the line away from most of the centres of population; curves were tightened and the tunnel was shortened making the line higher and steeper than originally planned and it was decided to abandon the double track layout for single track. A further Act of Parliament was required because construction had not been completed within the statutory five years. On top of this, construction of the tunnel encountered severe geological problems. The survey had confidently predicted that the tunnel would be through solid chalk, but in reality, about two thirds of the length was through a limestone shale which was very unstable. A writ was served on the York, Newcastle & Berwick Railway (YNBR), successor to the N&DJR, to honour the promise of its predecessor for the construction of the Thirsk & Malton line. This resulted in an Act for the construction of the Thirsk & Malton Railway (T&MR) being passed in 1851 and work on that line commenced soon after and progress was rapid. In 1853 the M&DR was finally completed as was the T&MR. The opening train of shareholders and dignitaries covered both the T&MR and the M&DR; it started at Malton, ran to Pilmoor (the junction with the York Darlington main line) and then back through Malton and straight on to Driffield and finally back to Malton. At this point the Board of Trade inspection had been made but had not cleared the line for public service. The inspector stipulated that various changes be made. These were acted on immediately and a further inspection a few weeks later gave the all clear. From the outset, the YNMR operated the line. In 1854, the YNMR, the YNBR and the Leeds Northern Railway amalgamated to form the North Eastern Railway (NER); the M&DR board were aware of the plan and applied to join the new company. There was general agreement, maybe because the YNMR held a large stake in the M&DR, so the line became a founder member of the NER with a director on the board. From this time, the line settled down to become a quiet, rural branch and apart from the mineral trains of the 1920-50s period saw little exceptional activity. The line closed in 1958 and was mostly lifted soon after. However, there was a stub left at Malton to provide access to the bacon factory and to the T&MR line. At the Driffield end, the double track section from Driffield West was still in use for trains to/from the Market Weighton direction until 1965. Burdale tunnel was bricked up in 1961 following a bad roof fall. Thank you to Martin Bairstow for permission to use the photograph of Burdale Tunnel.